I had never even heard of this place until my friend Natalie suggested that we meet up there to catch up and transact some lia sophia business over wine while enjoying the musical talent of her fiance Mike Vial. It’s not an overly large venue, settled unobtrusively in a strip mall, but it has a great vibe to it. They also won my tastebuds over with their Autumn Breeze Pomegranate Riesling and warm brie with green apple and water crackers. It definitely proved itself worthy of a second trip despite being a bit of a drive away. I have utterly failed to find a link to the site of the actual producers of these very tasty chips. Nevermind, it was on the bag. Sure chips aren’t the healthiest of snacks, but at least these have spinach as the third ingredient on the list (potatoes are first followed by vegetable oil). They’ve also got a lower calorie and carb count per serving than your average bag of chips. I may just have to stop back in at Big Lots and get a second bag this week. Reading is one of those things that, if you’re like me, you always want to do more of than you have time for, but if you have any interest in Interaction Design this book is well worth carving out the time. There is so much that can be pulled from it that I’m planning to read it twice – the first time to just absorb and then again to actually take notes on it for work. 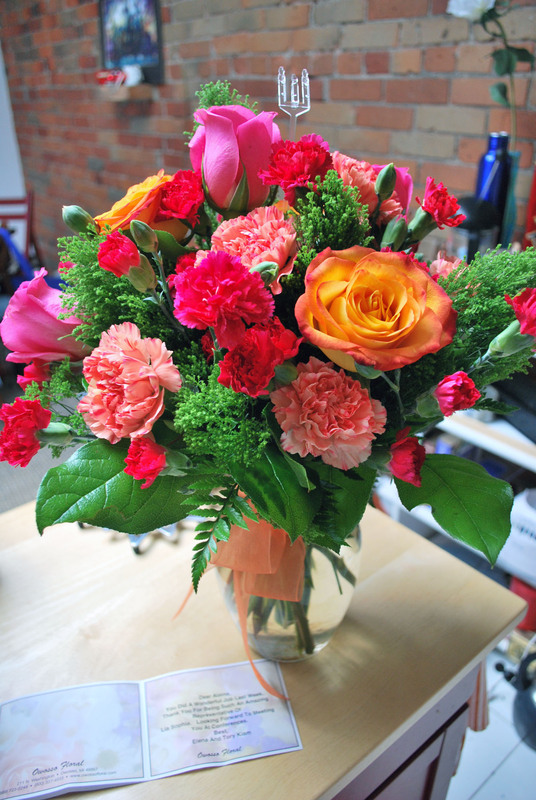 This past Friday I received a lovely bouquet and thank you note from the Kiams for the lia sophia spot Mom and I did on Fox 2 Detroit week before last and it reminded me how much I love orange roses. Actually, I love any flowers in that particular vibrant orange darkening to almost red at the tips color. Poppies. Tiger Lilies. Orange Roses. Also, a little tidbit for those interested in the meaning imbibed into certain flowers, orange roses stand for enthusiasm, desire and fascination. This is one of those awesome groups whose events I wish I could make it to more often, like their upcoming DIA photowalk on June 4th. I’m already booked that day or I would definitely put myself on the wait list to take part. It was a blast shooting with them when I went last summer. You can find them online on Facebook and flickr.